In this tutorial, we will setup HTTPS with Apache on Ubuntu server and generate free SSL certificate from Let’s Encrypt. It is a free certificate authority which can issue free certificates with a valid duration of 90 days and the certificates cost nothing to implement. It is assumed you know the basics and importance of HTTPS and SSL in terms of safety and security. There are several ways to generate a Let’s Encrypt certificate. You can generate Let’s Encrypt certificate via ZeroSSL online tool. Click on Online Tools > Start button to get started. In Details screen, you can enter email, domain name and accept the TOS. If you want to use the same certificate for multiple domains and subdomains. You can enter it as comma separated. There are two approaches for verifications DNS or HTTP. In DNS verification, you need to access your control panel and add a TXT record specified in Verification step in wizard. Once the record has been added, you’ll need to wait at least 5 minutes for propagating the changes. In HTTP verification, you need to create appropriate files with specific text strings under a particular directory specified in verfication wizard. You can select any option as per your convenience. On Next click CSR will be generated. you can copy and save it. After that, verification step comes. You need to do as per your verification criteria. If everything is working fine then It will generate your certificate and you can download both Domain certificate and Domain key. After that, you have to go through different steps to customize certificate options. When installation is finished, you will get the generated certificate files at /etc/letsencrypt/live. 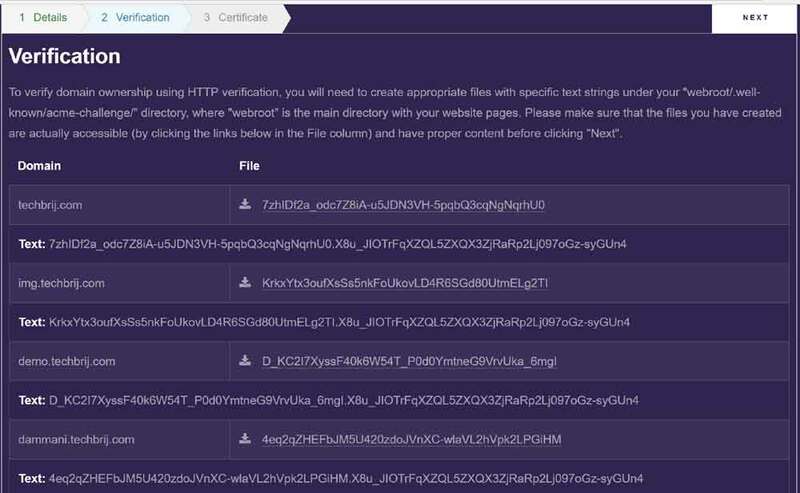 As the certificate is for 90 days, Certbot will renew your certificates and reload Apache to pick up the changes. If the automated renewal process ever fails, Let’s Encrypt will send a message to the email you specified, warning you when your certificate is about to expire. Note: The above process will install certificate on web-server. If you want to obtain only the certificates from Let’s encrypt and setup manually on web-server, you can do so by running the following command instead of the above. If you used ZeroSSL way, certbot manual approach (not automatic) or want to setup manually ignoring cPanel, zPanel (Sentora)…etc then the next step is to configure Apache for the certificates. Here 301 permanent redirect is done for preserving SEO rankings of the link. Update path with your location of certificates. For newer Apache version, SSLCertificateChainFile is no longer needed. Use Mozilla SSL Configuration Generator to generate Mozilla security recommended webserver configuration files for different webservers with different versions. If you are getting “Chain issues – incomplete” then check for chain file. Make sure it is properly defined. If you are defining SSLCertificateChainFile then make sure it is just after SSLCertificateFile. Sometimes, the order of certificate definition matters and restart the server. 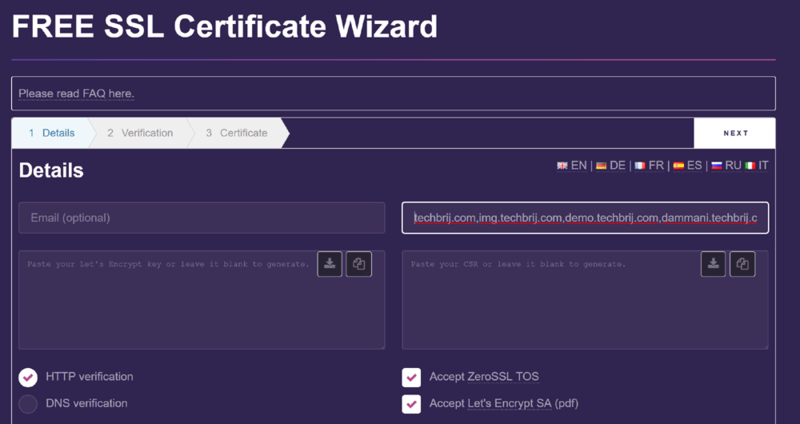 In this tutorial, we saw different ways to generate Let’s Encrypt free ssl certificates (via ZeroSSL and Certbot) and configured Apache to setup the certificates. Finally, SSL setup is done without any cost. SSL service is very efficient and effective for websites to build up a link with their web server. SSL is a trustworthy security process which works on encryption certification. Great post.